Big News: Orvis Fly Fishing Podcast and the Orvis Hunting and Shooting Podcast are now available in their entirety on Spotify, which will update automatically when we upload new content. Do you stop fishing for smallmouth bass when summer ends? If you do, you could be missing the best bass fishing of the year and the chance at your biggest smallmouth. Mike Schultz–of Schultz Outfitters in Ypsilanti, Michigan–is one of our foremost experts on smallmouths and the designer of some of our most popular flies. This week he shares a wealth of knowledge on how to modify your tactics to continue to catch smallmouth bass on the fly rod well into winter. This is a topic that no smallmouth lover wants to miss. Can I put a 3-weight or a 7-weight line on a size 5/6 reel? How do I store poppers with weed guards? Do you have some suggestions for catching catfish on a fly? How do I attach a wire bite guard to my leader? How do I find wild trout in a small, clear stream with sandy bottom that does not have a high fish population? Do fly-tying materials go bad with age? How should I store my hackle capes and deer hair? Do you have tips for catching lake-run brown trout? Can I use a switch rod in Belize? Do you have a suggestion for a pair of cheap wet-wading shoes? When do you recommend catch and release and when do you recommend keeping fish? How can I get the elk hair on my caddisflies to keep from rolling around the hook shank? 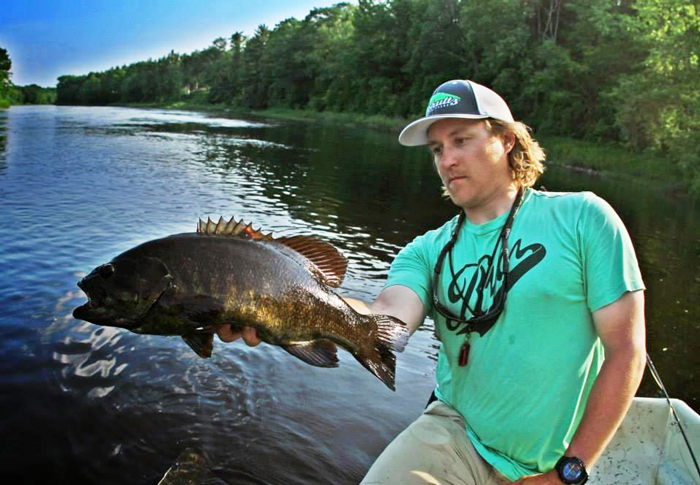 Mike Schultz shows off a bruiser bronzeback. Yes, more smallmouth please! And it’s great to hear discussions for off-peak season fishing.